Malaga vs Real Madrid – Real Madrid coach Zinedine Zidane left top scorer Cristiano Ronaldo at home for his side’s Liga game away to basement club Malaga on Sunday, also resting Gareth Bale, Luka Modric and Raphael Varane. 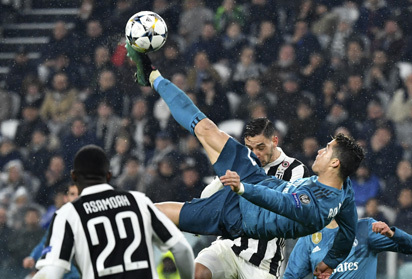 Real Madrid’s Portuguese forward Cristiano Ronaldo (C) scores during the UEFA Champions League quarter-final first leg football match between Juventus and Real Madrid at the Allianz Stadium in Turin on April 3, 2018. Ronaldo has been rested for four of Real’s last five away games in La Liga in order to stay sharp for their Champions League games, missing their trips to Leganes, Espanyol and their last outing against Las Palmas. The plan has paid dividends as Ronaldo has scored in all 10 of Madrid’s European games this season. This includes striking the decisive injury-time penalty in the 3-1 defeat to Juventus on Wednesday which sent them into the semi-finals 4-3 on aggregate. The post Malaga vs Real Madrid : Zidane leaves Ronaldo, Modric, Bale out appeared first on Vanguard News. Next Nollywood’s ‘Ojukokoro’, 3 others screened in U.S.